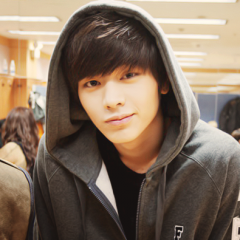 Showing results for tags 'yook sung jae'. OFFICIAL YOOK SUNGJAE (육성재) THREAD Name: Yook Sungjae 육성재 Stage Name: Sungjae Date of Birth: May 2nd, 1995 Group: BtoB - Born to Beat Position: Vocalist, Rapper, Maknae Height: 180cm Blood Type: A Agency: Cube Entertainment Education: Hanlim Multi Art High School and Dongshin University Instgram (private): @six_tt Twitter: @BTOB_6SJ FILMOGRAPHY DRAMAS: Monstar (2013 tvN) - Arnold (Men In Black member) - Supporting Actor The Heirs (2013 SBS) - Himself - Cameo Reply 1994 (2014 tVN) - Sooksookie - Supporting Actor Plus Nine Boys (2014 tVN) - Kang Ming-gu - Third Male Lead Who Are You: School 2015 (2015 KBS) - Gong Taekwang - Second Male Lead The Village: Achiara's Secret (2015 SBS) - Park Woo-Jae - Male Lead DISCOGRAPHY SOLO Curious About You (2014) - Plus Nine Boys OST Part 4 Love Song (2015) - School 2015 OST Part 5 Photograph (2015) - Duet with APink's Kim Namjoo BtoB KOREAN: Born to Beat (2012) Press Play (2012) 2nd Confession (2012) Thriller (2013) Beep Beep (2014) Move (2014) The Winter's Tale (2014) Complete (2015) JAPANESE: FANSITES ONLYOOK - @ONLYOOK_com Oh My 6 - @ohmy6_net Happy Virus 6SJ - @happyvirus_6sj Starry Moment - @950502_net Yook Lover - @YookLover YookTory - @YookTory Yookstyle - @yookstyle Sungjae Time - @666_sj LoveSTAR6 - @LoveSTAR6 성재ONTOP- @sungjaeontop 성재야 사랑해 - @mintlatte52 Picturesque - @picturesque_sj SweetDew - @SweetDew0502 Lovely Castle - @lovely_6castle xiaocai6sj - @xiaocai_6SJ 스프링소나타 - @0502JSJ Yook make me Smile - @yooksmile May of Panoroma - @panorama_6 푸른달성재 - @BtoB_030 Sungjae_Fanbase - @Sungjae_Fanbase FACTS ABOUT YOOK SUNGJAE Family: Father, mother and an older sister. His father is a CEO of an IT company. Education: Seowon Elementary, Seowon Middle School, Hanlim Arts High School, Dongshin University (Practical Music Major). He studied English in Cebu, Philippines. Personality: Timid, positive, and lively Ideal Type: Shin Minah - a cute, thoughtful, and enthusiastic woman Role Model: Kim Dongryul Usual Fashion Style: Dandy and sophisticated fashion Music he listens to:Na Yoonkwon - Since that Day, Kim Dongryul - Old Song Bad Habits: Spacing out Favorite food: Dwinjang jjigae Favorite color: Red and Black Favorite Number: 6,66,666 Place he visits often: Practice Room Celebrity Friends: A Pink’s Kim Namju Favorite Movie: Bruce Almighty Motto: “Pom Saeng Pom Sa (The Way Of Man)” - “Pom Saeng Pom Sa” means you live by “pom” and die by “pom.” Saeng means life and Sa means death. Pom is a Korean modified word for “form”. Form meaning by figure or poise. In other words “Poise is the absolute factor in life.” Hobbies/Specialties: Fishing, Snowboarding, Japanese, Shopping All credit goes to Yook Sungjae official page on One Hallyu and Yook Sungjae Facebook fanpage.